We may only be a couple of weeks into 2019, but Jason and Brittany Aldean have already had an eventful year. A lot of things are changing for the couple, and fast. For starters, Brittany is currently expecting their second child together, a girl they plan to name Navy Rome. She’s due in February, but admits that little Navy could make her arrival any day at this point. On top of preparing to welcome another baby, Jason and Brittany have been busy moving to a new house. Over the summer, just one day after announcing that they were expecting their second child, Brittany revealed that she and Jason were in the process of building a new house. She announced the news by sharing a photo of the land where their new home would one day rest. In October, Brittany posted a few photos to show how work on the new house was coming along. The photos didn’t show much, as only the basic framework was down at the time. But what the photos did show is how gorgeous the Aldean family’s new plot of land is. After that, Brittany remained pretty mum about how progress on the new house was going, or when they were going to be able to move in. Fans started to wonder if it would be sooner rather than later, since she hadn’t shared any pictures of a new nursery for baby Navy. Back when Brittany was expecting her and Jason’s first child, son Memphis, she unveiled his nursery design months before he was born. 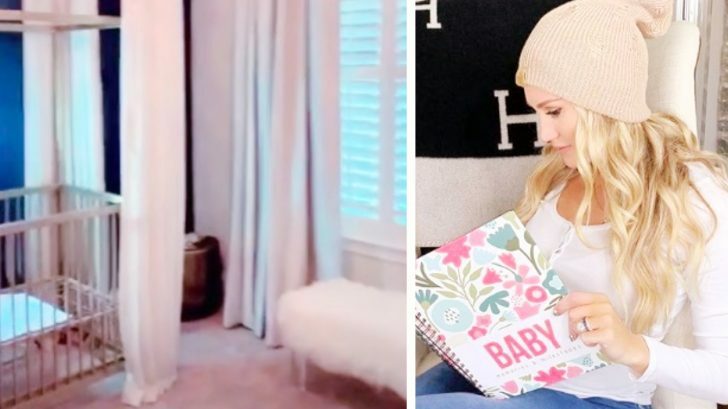 So as Brittany’s due date with Navy inched closer and there was still no nursery reveal, fans couldn’t help but wonder if it was because her nursery was being planned in the new house, rather than the old one. Sure enough, Brittany confirmed that she and Jason were in the process of moving when she recently posted a photo of herself resting against some massive moving boxes. However, as Brittany shared on Instagram, their new home won’t be ready for another year, so they’re living in a temporary home for now. Still, it appears that the couple has started to make themselves at home, and Brittany has slowly been revealing pieces of their temporary house. The first sneak peek she offered was of a new playroom for Memphis, complete with a ball pit. We’d say the little man is a fan of his new place! Next up, Brittany finally wanted to showcase what she has been able to accomplish in Navy’s nursery so far. 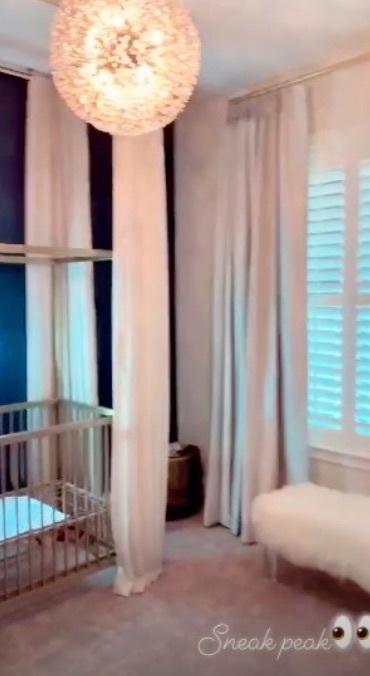 As she explained on her Instagram Story, she had held off on designing her nursery since they sold their old house, and couldn’t get started on it until it was time to move. 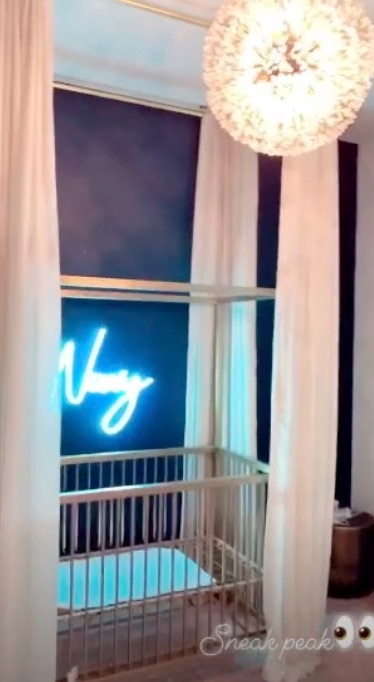 She also shared a short video of what Navy’s room looks like right now, and it seems fit for a princess! The room is done up in tones of blush pink, with a navy blue accent wall serving as the backdrop for baby Navy’s crib. Her name is spelled out in neon lights above her slumber spot. You may recognize the look of that neon sign from Brittany’s baby shower, which is where she first revealed Navy’s name to the public. Navy’s nursery isn’t complete quite yet, but Brittany has already managed to make it feel elegant and girly. A brilliant, sparkling light hangs from the ceiling, while a flowing canopy drapes around her crib. What a beautiful space for a bouncing baby girl! We can’t wait to see more of Navy’s nursery as Brittany and Jason go about adding the finishing touches to the space. Knowing how much they love to gush about Memphis, we’re sure they’ll instantly be gaga for their little lady after she arrives. It only makes sense that they’d want to give her the best!